Information accumulated through observations of phenomena that occur in the natural world, or which are created as experiments in a laboratory. Scientific evidence usually goes toward supporting or rejecting a hypothesis. collected through observation and/or experimentation. Nothing outside the observable or measurable can be called scientific. Therefore science cannot inform public law, morals, ethics, or religion. For example, science can estimate the depth of the ocean; this is both observable and measurable. Science cannot answer the meaning of life; this is neither observable nor measurable. An established principle thought to be universal and invariable; see also hypothesis, theory. expresses a theory as a less complex summary statement, often as a mathematical equation, such as E = mc2. 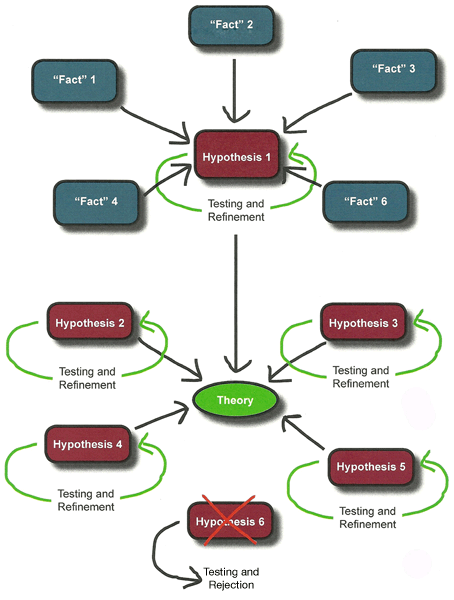 Note that the scientific use of the word “theory” is fundamentally different from its common usage. In everyday English, a theory is a mere guess or speculation. However, scientific theories are the highest order of scientific explanation and are generally accepted to be true by the scientific community as a whole. Evolution is a scientific theory based upon evidence provided by all fields of biological science. In physics, a similarly supported theory is gravity; in chemistry, a good example is the atomic theory.